So this blog talks about food. Does a dog meal or dog beds count? Why not? My family considers Oreo a part of the family so I think it’s okay if I discuss something about our pet here especially about the food he loves to eat. Well, Oreo basically loves to eat anything that we eat. When he sees us munching crackers or chips or chocolates, he will sit beside us or in front of us wearing that “paawa” look on his face. Who would not give in to that doggie cute face hmm? 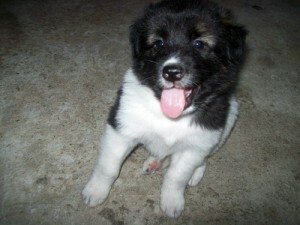 This entry was posted in Favorite Food and tagged dog bed, dog food, dog meal on February 10, 2011 by Yami. aw! such a cutie “paawa” face… ang cute naman..
by the way sis, im here following you from the bloggers exchange.. hope you can follow me too. thanks! Oh your Oreo sure looks cute! Kami rin we have a new house member and we named her Jewel. Ayun takam na takam sa caldereta ni mommy.